The ALU-GLIDE has been developed to complement the Series 1000, Series 300 & Series 9000 Aluminium Partition Suites. With a matching 32mm edge profile, the ALU-GLIDE is a breakthrough innovation which allows sliding door units to match the rest of the partition fit-out. For use with both 64mm and 92mm studs, the unit includes recessed receiving stiles, commercial grade tracks and fittings, and provision for Schlegel. The 64mm range will take doors up to 2700 x 1200mm with a maximum door thickness of 35mm. The 92mm range will take doors up to 2700 x 1200mm and allows for 35mm, 40mm or 45mm door thickness. The 92mm range is also ideal for sliding aluminium glazed doors. Units are custom made to order. Allow 5 working days for anodised units. Powdercoating is a further 3-5 days. Click Here to access Alu-glide Cavity Slider Technical Brochure & CAD Drawings. 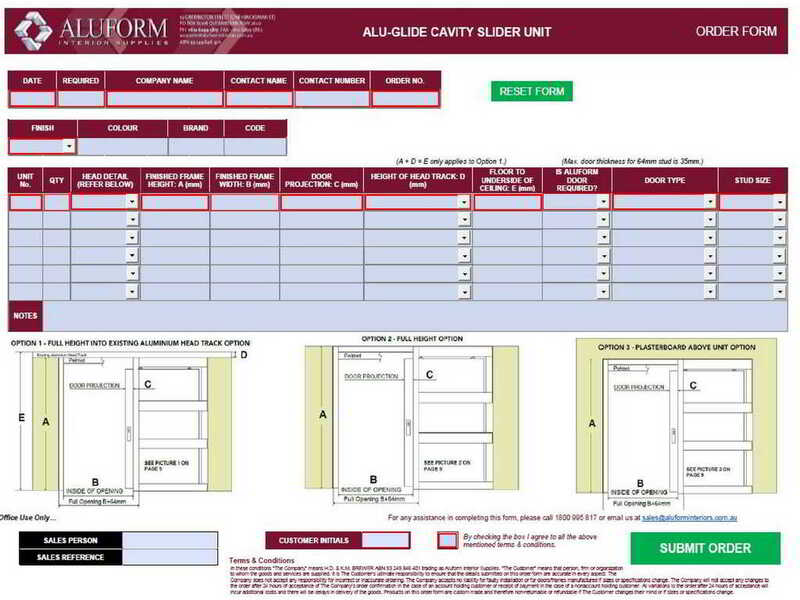 To place an order for Alu-Glide cavity sliding units, click on the link below to download our interactive order form and fill out the details online. Then click on ‘Submit Order. Once we receive your completed order form, we will send you an order confirmation. For non-account customers, payment is required before the order can be processed.